policies and practices at the institutional, local, and state level that support engagement in research and scholarship. This is the 171st volume of this Jossey-Bass quarterly report series. Essential to the professional libraries of presidents, vice presidents, deans, and other leaders in today's open-door institutions, New Directions for Community Colleges provides expert guidance in meeting the challenges of their distinctive and expanding educational mission. John M. Braxton is a professor of education in the Higher Education Leadership and Policy Program at Peabody College of Vanderbilt University. Arthur M. Cohen is professor emeritus at the UCLA Graduate School of Education & Information Studies. This chapter describes the findings from a national survey of community college faculty. With the lens of Boyer’s Domains of Scholarship applied to these findings, a more fine-grained and accurate assessment of the engagement of community college faculty members in scholarship emerges. This chapter describes three empirically derived types of faculty scholars in community colleges: Immersed Scholars, Scholars of Dissemination, and Scholars of Pedagogical Knowledge. This chapter discusses these types and offers a recommendation. 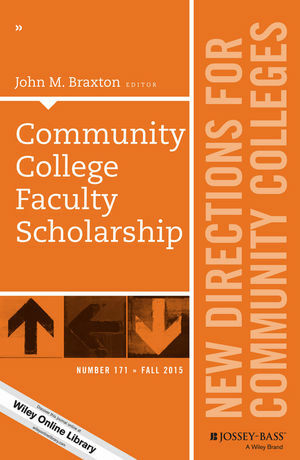 This chapter looks at community college faculty engagement in scholarship. Community college faculty spend the majority of their time engaged in teaching, and therefore their scholarship typically focuses on strengthening curriculum and instruction. The paper identifies some of the structural and cultural challenges and supports to scholarship at community colleges. The author concludes that mechanisms for encouraging and rewarding scholarship at community colleges remain underutilized. Professional associations established by and for community college faculty have forged a path to an alternative professional identity that recognizes disciplinary scholarship as an essential part of faculty work. The Achieving the Dream initiative have created a new environment and new forms of thinking among faculty that has spurred some to action research within their classrooms and beyond. This chapter describes the development of an applied research center at Atlantic Cape Community College and a statewide workforce training consortium run by the community college sector in New Jersey. This chapter contends that scholarship should become a part of the mission of the community college. The authors describe actions for individual community colleges and state and federal actions that encourage and support the engagement of community college faculty members in scholarship. This appendix describes the methodology and statistical procedures used to obtain the findings presented in Chapters 1 and 2. The appendix also contains Tables A.1 to A.4.